The cover reveals it all. 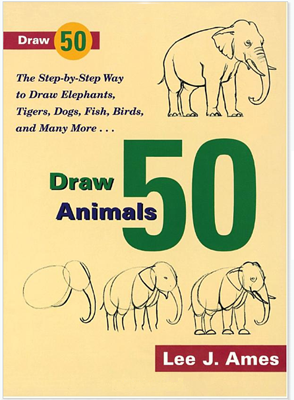 How do you draw an elephant? Why's this special? The key to learning is understanding the pencil structure, the scaffolding that's not always present in that final, finished elephant. Let's see how this analogy relates to learning. Is tracing different from drawing? You bet. Tracing is mimicry -- we don't know why a line is there. We just start in one corner and work our way around. Sure, we might make a pretty elephant -- but can we draw one with a different trunk? Standing on two hind legs? Probably not. Math is similar: we "teach" by tracing a student through the steps of a proof. But there's an underlying pencil structure that was in the mind's eye of the proof's author that we're not seeing. We're walking the student along the drawing ("Here is the head, here is the trunk, here is the leg") without show the mindset that created the proof ("The head is an oval, connected to a larger oval for the body; the legs are cylinders, which we smooth out."). If we're lucky, the student generalizes the steps and creates their own pencil structure. But why? Why do we leave the most interesting part of understanding to private contemplation? I love discovering these "aha" moments that put the result into place -- what's the mental map that made the facts snap together? When we share insights we can stop "tracing math" and begin drawing on our own. It's way more satisfying. What's the point of education: the results or understanding? If the goal are results, then art class should be about using stencils and tracing to make perfect representations. If the goal is understanding, then we should take out the pencils, make our lumpy apples and lopsided bananas and try our hand at still lifes. It's seldom either-or: we want results and understanding. Unfortunately, we focus on results because they're easier to test (Can you plug X into these formulas and get the right answer?). I'm here to remind us that we need to understand what's happening too. Focusing on rigor prematurely creates fear and trepidation -- What if I'm wrong? -- and encourages people to trace the inked results instead of learning how to experiment on their own. It makes you think math (or any subject) is something you get right or not at all. Which isn't the case -- many (most?) results have been developed intuitively and cemented later. Rigor/ink is emphasized because it's the only thing visible; I want to champion the (now-invisible) pencil lines which laid the original groundwork. Before seeing the Ames book, I thought you drew by starting in one corner and filling in the figure. Some experts may do that (more later), but the "normal way" to draw is by starting with a penciled foundation. We know writers need drafts. But do we allow drafts in learning? Are we so concerned with reproducing inked results that we discourage or ignore the pencil? Math developed through wayward paths and missed connections, not always by the smooth progression we see in our classroom syllabus. Showing only the final results makes it appear like it's supposed to progress linearly and unwaveringly. Maybe discussing how zero, negatives, and imaginary numbers were initially distrusted (and embraced) would help us empathize with students embracing the idea. I chuckle that we "matter of factly" introduce imaginary numbers when the experts of the time had objections. They're difficult, non-intuitive concepts (at first) -- it's ok to admit that we had some rough drafts crumpled in the corner. Wayward paths can help us better understand the correct ones. After my frustrations with learning new concepts, I've taken the philosophy that some structure must exist. 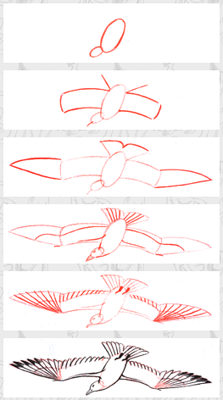 When I see a new concept (an inked bird, for example) I really think there must be some collection of shapes that make it make sense. If I'm having trouble, I blame my approach -- I'm just not seeing the idea in the same way as its inventor. Maybe someone else has written about it, or there's an analogy to another idea. But what if there's no underlying structure, just a perfect, inked elephant without eraser marks? It's possible. After you internalize an idea, you start thinking directly in ink. We don't "draw" the letter A in pencil -- we just write A because we're so familiar with it. Practice moves ideas into the "ink-only" stage, which let us work on bigger ideas. For example, you need need to commit arithmetic to "muscle memory" before you can understand algebra. If you can write arithmetic, you can learn to draw algebra. Once you can write algebra, you can draw calculus. And so on -- if you don't get arithmetic, Calculus (with its pencil-lines in algebra) will still look like a jumble. Sometimes we create "nice-looking elephants" through trial and error. Later on, we realize there's a common structure that can simplify future efforts. True learning is about discovering and exploring these structures, not simply generating the pretty elephants. Drawing a city after a helicopter ride is an amazing gift -- but I doubt it's transferrable. He goes far beyond the underlying pencil structure that "regular" artists would need. Beginners need the pencil marks -- experts who've internalized them sometimes forget that. True learning happens when people can recreate that structure in their minds. When the experts can remember what it was like to not "see it all at once", then real learning can happen. I want to share the pencil sketches that evolved into the elephant, instead of erasing them and pretending that I, too, can just draw from memory. I'm sure there's more analogies hidden in there somewhere. The process of drawing -- pencil structure, inked result -- captures thoughts about learning that have been rattling in my head. Don't learn by tracing: find (or invent!) those pencil structures. Seeing the pencil lines makes the idea become your own: you can modify it, combine it with others, or just appreciate it at a deeper level. And that's the joy of learning.